Excitement surrounding the potential of VS2 has been growing in recent years, but until now, Koratkar said, researchers had been challenged by its instability—a characteristic that would lead to short battery life. The Rensselaer researchers not only established why that instability was happening, but also developed a way to combat it. The team, which also included Vincent Meunier, head of the Department of Physics, Applied Physics, and Astronomy, and others, determined that lithium insertion caused an asymmetry in the spacing between vanadium atoms, known as Peierls distortion, which was responsible for the breakup of the VS2 flakes. 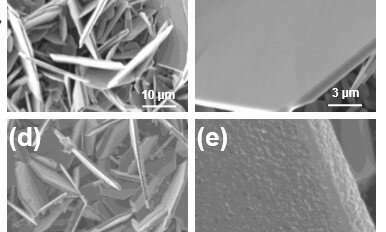 They discovered that covering the flakes with a nanolayered coating of titanium disulfide (TiS2)—a material that does not Peierls distort—would stabilize the VS2 flakes and improve their performance within the battery. Provisionally good news, as charging time is one of the three prime hurdles for electric cars to become practical and widely adopted. So I switched to an EV, and I can't really say that charging time is an issue at all (neither on short trips nor on longer ones). The range is in the region where you take a break anyways. If I take a 20 minute break I don't care if my car fills up in 5 minutes at a pump or charges the full 20 (actually the latter is a lot less hassle. You plug in; leave; come back; unplug. With an ICE I have to stay at the pump; go pay; and find an extra parking space afterwards if I want to take my break). That's the point I feel a lot of people don't get: The time your CAR takes to load up on energy - be it fuel or power - is irrelevant. It's the time that YOU invest in that process that's relevant. Vanadium is not very abundant, and it's already in short supply for making different metal alloys for tools and machine parts. If you start using it for batteries as well, the price is going to skyrocket. I live on the 7th floor. How do I get the car up to my apartment so I can charge at home? Second question, where can I find an electric car that costs between 4000 - 7000 €/$/£ and goes for 400-600 km per charge? The time your CAR takes to load up on energy - be it fuel or power - is irrelevant. It becomes very relevant if your battery is empty and you need to get going somewhere. That would be the case for example, if you wake up in the morning and find that you forgot to plug in last night, someone else used the car and didn't plug in, some wise guy unplugged it out of vandalism, or there has been a power fault that stopped the vehicle's charger, or the breaker tripped, or the car didn't charge up during the night for any other reason. That's when you'd be glad to have a bigger battery with power in reserve, or the ability to charge up at the nearest service station in five minutes. Maximum range when new, or maximum range when the battery is old? Don't forget you lose up to a third of the range as the vehicle ages. For a car with 150 km range when new, it fades to 100 km when old, and depending on the weather and local climate you can lose another half of the range. Worst case it goes from 150 km to 50 km which for a round trip means the furthest you can go and still get back is 25 km (16 mi). That's terrible. And then you have to define what "most trips" means. Let's say 95% of trips - you'd still expect to see 18 days a year - more than once a month - when you have to go "Oh, I can't drive my expensive EV because it just doesn't go far enough". "Second question, where can I find an electric car that costs between 4000 - 7000 €/$/£ and goes for 400-600 km per charge?" @Eikka- Since the average price of a new car was $35,300 in 2018, you are going to have to settle for a very used (or flimsy cheap) car for $4000 to $7000. It will be quite a few years before you can get a decent Tesla or Bolt in this price range. So it is lucky for you that you intend to be a late adopter of electric vehicles. a) No one needs 600km range. No one. No one drives such a range without a pause - and you can easily charge up during a pause. Realistically you need 300km range. Tops. At 200.000 km in a Prius and the battery is still fine, it hasn't lost anything noticeable. Many reports from Tesla drivers that their battery range loss after a lot of driving is negligible.